Children ages 10 and younger won't be admitted without an adult or legal guardian present. All children using floatation device, mask-style goggles, and children ages 8 and under must be supervised by an adult at all times while in the water. Therefore, they both need to be in the water. Please Walk. Do not run. Always shower with soap before entering pool. Please keep food in designated areas and out of locker rooms. Only proper swim attire allowed — no street clothes will be permitted. NO EXCEPTIONS! Click here for more information on the swimming attire policy. Only one person at a time on diving boards. No diving from sides of pool. No swimming in diving pools. Only soft balls are permitted (i.e. no tennis balls, footballs, racquetballs, etc). Please don't distract or visit with lifeguards. Please always obey our Lifeguards. Adequate supervision is required. One leader per 10 children. Supervisors must be in the water with the group to assist with supervision. Have your group line up in single file. Pool cashiers need a count of all group participants. Take an accurate count of the group before entering and exiting. Have money collected from the group prior to arrival at the pool. Present admission fees to cashier upon arrival. Brief individuals in your group of all pool regulations. Provide the cashier with the name of the person in charge of the group, as well as site and telephone number. Arrive and depart on time and only as scheduled. Inform the pool of cancellations as soon as possible. 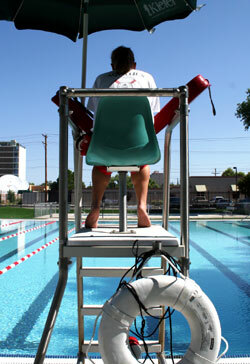 Problems should be referred to the Pool Supervisor or Head Guard. Groups cannot utilize the wading pools due to the limited size. Bring children dressed to swim. All persons in the pool must have on proper swim attire. Clean cotton t-shirts and shorts are allowed on the pool deck, however patrons must have on proper swim attire underneath. "Street clothes," Brazil/French-cut, thong style and/or revealing swim wear, cut-off jeans, jeans, skirts, basketball shorts, leotards, leggings, dri-fit wear. Underwear and undergarments are not allowed to be worn under swimsuits. Patrons will sometimes ask us, "Why do I have to wear proper swimwear?" Here are a few reasons as to why it is important to only wear proper swim attire in the pool.